"The extraordinary fact is that while all visual patterns have a center of gravity which can be technically computed, no method of calculation is as fast, as accurate, as automatic as the intuitive sense of balance inherent in man's perceptions." 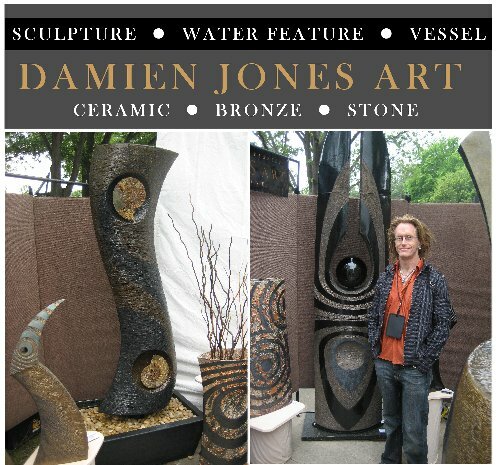 Damien Jones and his artwork siliently preside within a vendor space at the Cottonwood Arts Festival in Richardson, Texas. In passing, my wife and I immediately take notice of his 3 feet, 6 feet, and 9 feet tall ceramic sculptures. Some of them have utilitarian functions such as a tall container for holding items like umbrellas or decorative sticks or, a water feature for washing or relief of stress. Other sculptures are purely created for aestetic reasons. However, irregardless of the sculptor's intentions, each art piece appears to comprise a set of lines, colors, and textures resonating outward in various patterns from a central emanating core or set of cores much like a rock or rocks thrown into a pond causes a pattern of ripples in various patterns. The patterns designed by Damien embody the ability to speak to our emotions in opposing ways. The top of one of his sculptures may say "go away" while the bottom of the same structure may say "come hither". The left and right sides of another sculpture may say "I am your enemy" whereas the center of the same sculpture may say "I am your lover". Other sculptures may remind you of night and day, war and peace, earth or sky, or even angels or humans. These are only a few examples among the infinite list of possibilities. The art of Damien Jones is a beautiful totem pole that points us in the right direction toward balancing the chaos and order in our lives. People sometimes forget about the these vital but opposing ways - chaos and order - that journey with each of us daily. Whether, we participate in language or visual literary, chaos and order, follows us. Renata Hi, I am at the cottonwood arts festival with? Renata And you are a sculptor? Damien I am a sculptor. I was an engineer for fifteen years and then I quit that four years ago and dove into my artwork full-time [pause] and for the first two years I was making vessels about three feet tall and then I started stacking them into full-size sculptures. So, now, everything I do is pretty much six to nine feet tall! [pause] It has really been a beautiful exploration of creativity. I didn�t know I had such art in me when I started down this path and I am just really over-joyed with what I have been able to create. Renata I see some of them are fountains ... are all of them fountains? Damien No, about half of them have water features and about the other half are pure sculptures. Renata What made you decide to do a water feature? Damien I really like the way the water just brings the piece to life. [pause] and what it takes to just get something to flow beautifully to accentuate a piece. Ahh, its just kinda facinated me and its really added another level of depth to my work. Renata [pointing to a piece behind them] And this piece here behind you, what inspired that one? Renata Wow, [pointing to piece behind them] how do you spell that? Damien Obsidian? O-B-S-I-D-I-A-N. And I wanted to create a piece that surrounded it and that would bring it [the obsidian] to life so I created this piece [pointing to piece surrounding obsidian] which kinda looks like a black angel rising out of the darkness to embrace the light which is not really what I had intended initially but that�s what the finished piece came out looking like which is a real inspiration. Renata What made you decide to do sculpting for outdoors? Damien Well, I had been working in clay for about fifteen years making some really beautiful and interesting work. And there is not many people working on my scale at the size that I am working at with ceramics and it just seemed a lot more fun than engineering so I took the leap and its been serving me really well. Renata What type of engineering? Damien I was an industrial designer so I was designing consumer products. Renata Great! I thank you and is there anything you would like to add like a web site? Perhaps? Renata And you are out of what city? Renata Well wonderful, thank you so much. Damien You can contact Damien Jones at w.damienjonesart.com. To see or hear the full interview, members can login to the ForgottenGreats.com private articles and catalogs.